Since debts can only be repaid if a country generates money through economic activity, some countries may seek to expand their industrial bases or conversely the tax base from which they can collect tax revenues to pay off their domestic debt. 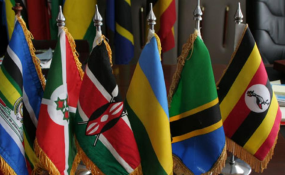 The East African region had by 2017 accrued debts amounting to $127.76 billion on an annual gross domestic product that stood at $249.56 billion in that same year. On the continent, the region is a little less indebted than South Africa whose total debt amounted to $191.8 billion in 2017. Nigeria's debt in comparison stood at $100.7 billion. Nigeria and South Africa are the continent's largest and second largest economies respectively. That Nigeria was less indebted than South Africa and East Africa can be attributed to its oil revenue that funds the greater part of its national budget. Whereas the Nigerian government received a big chunk of its funding from oil revenue, South Africa taxed its industries and the difference was funded through borrowing. South Africa's advanced integration into international capital markets and its large industrial base offer the government a high level of liquidity, meaning it can run large debts with greater ease than its East African counterparts. In 2017, South Africa's domestic debt stood at $177.85 billion to East Africa's $52.533 billion. In the same year, Nigeria borrowed $69.6 billion from the domestic market. Nigeria's oil revenue gives it room to borrow less from its domestic markets compared with South Africa. Concurrently, Nigeria's large and relatively advanced industrial base allowed it to borrow more from the domestic market than East Africa did. This seems to suggest that whereas East Africa may be approaching the limits of domestic borrowing, Nigeria could still borrow more. In other words, without economic growth, especially industrial growth, East Africa's domestic borrowings may not move much further beyond the point they have reached. On the other hand, Nigeria's petroleum revenue should keep the government from dipping its hand too deep into the Nigerian financial sector's pockets for loans. On the whole, South African citizens are the most indebted of the three peoples. Each South African owes $3,342 to lenders whereas Nigerians and East Africans owe $514.14 and $447.34 respectively. In other terms, Nigerians owe 27 per cent of their income to lenders whereas East Africans and South Africans owe 52 per cent and 55 per cent. That means that irrespective of the mix of foreign and domestic lenders, South Africans are the most indebted, Nigeria prefers to rely on oil revenue to fund its budget and East African countries do not have an especially marked preference for either form of debt. When East African debt is disaggregated among nations, there appears to be a correlation between indebtedness and economic heft. The region's three largest economies, Ethiopia, Kenya and Tanzania, are also the most indebted. Ethiopia's $47 billion bill is the largest, followed by Kenya's at $43 billion and Tanzania at a distant third with a total debt of $20.5 billion. Tanzania, Uganda, and Rwanda are distinct for their preference for foreign debt whereas Burundi borrows more domestically than it does internationally, making it an outlier in the region. Its peculiar politico-economic situation may be to blame. Kenya and Ethiopia share a thirst for debt wherever it can be found and both nations split their borrowings between domestic and international sources almost equally. In absolute terms, Uganda, Rwanda and Burundi are the least indebted in that order. They owe their lenders, domestic and foreign, $10.7 billion, $3.78 billion and $2.26 billion respectively. By 2017, Burundi's total debt stood at $2.26 billion. Should President Pierre Nkurunziza's government feel pressured to meet its domestic obligations, it may resort to printing more money to pay off domestic debt. In other words, depending on the urgency of the debt, excessive domestic borrowing on this weak industrial base could fuel inflationary monetary policies. Civil war has left Burundi plagued by economic malaise while its autocratic political arrangements have subjected it to further ostracism by the international community. These two trends imply that Burundi is having difficulty obtaining funds from bilateral and multilateral development partners - including the International Monetary Fund and the World Bank. Furthermore, its small industrial base gives it little access to international capital markets. Its fellow least developed countries of Rwanda, Tanzania, Uganda and even Ethiopia seem to have better luck in raising funds from bilateral and multilateral circuits. Until recently, Ethiopia enjoyed billions of dollars in loans from China and the more traditional development partners. Notably, Burundi's domestic debt is materially greater than the $990.58 million owed to domestic lenders by its more prosperous neighbour, Rwanda. This adds to the implication that Burundi faces geopolitical and economic ostracisation in the world. Rwanda, Tanzania and Uganda share a marked preference for international borrowing. Their governments may simply face difficulties in raising funds whether through taxes or by massive public borrowing schemes. The three countries' economies may be of different sizes but their shared commonalities in relatively small industrial bases translate into a small taxable base. Furthermore, their financial markets are not liquid enough to support the kind of large-scale domestic borrowing Kenya and Ethiopia enjoy. Each Rwandan, Ugandan and Tanzanian owe $79.239, $67.63 and $18.02 respectively to domestic borrowers. At $797.8 million, Uganda's domestic debt was smaller than Rwanda's domestic debt. Ethiopia and Kenya are almost identical in their debt preferences. Both countries seek out money wherever it can be found, whether domestically or on the international market. The appetite for large infrastructure projects of both countries explains a large part of the domestic debts accrued. Kenya owes domestic lenders $22.3 billion whereas Ethiopia owes about $23.1 billion. The Millennium Dam is one of the more notable of Ethiopia's infrastructure projects given its estimated cost of $4.8 billion, $3 billion of which is to be financed domestically. Financing was to be achieved through a mixture of bank lending and levies on income. These two largest economies in the region have had the least difficulty in running up large debts. Unfortunately, excessive borrowing by the public sector could crowd out domestic borrowers and reduce the potential for the kind of economic growth needed to help pay off both domestic and foreign debt. Domestically, Kenya continues to borrow heavily to fund the running of public services and works. The downside is that if it continues to consume domestic loans at the rate that it is doing, there will be little left for private borrowers. As Kenyan lenders signal an understandable preference for government securities for their low risk and administrative costs relative to private loans, excessive domestic borrowing by the government reduces the quantum of loans available to private domestic borrowers. As domestic loans are paid off in local currency, excessive borrowing could also fuel inflationary monetary measures should those loans be called in the near term. Debt-consolidation efforts and resisting the temptation of excessive domestic borrowing could however relieve the burden the public sector continues to inflict on the domestic market for loanable funds. Ethiopia faces a debt crisis of a slightly different kind. Capital controls starve the nation of foreign currency -- currency that could be invested in the economy and drive growth. Crowding out of local markets by expansionary fiscal policy will also have a similar effect as private enterprise finds itself starved of financial capital. A foreign currency crisis coupled with domestic illiquidity could signal economic stagnation, inflation and other socio-political difficulties. Making peace with its neighbours, privatisation and aid might give the public sector an injection of cash substantial enough to relax the pressure on the domestic financial market. Whose debt burden is greatest? East Africans owe their lenders both foreign and domestic an average $447.34 each. This figure is smaller than the per capita debts of both South Africans and Nigerians at $3342.1 and $514.14 respectively. This can be explained by the structural inferiority of East Africa's industrial base against the region's population, which is larger than both South Africa's and Nigeria's combined. This also suggests that East Africans are not as economically efficient as the Nigerians and South Africans. That inefficiency is apparent in per capita GDP figures that show that South Africans earned around $6,000 on a per capita basis while East Africans earned mere $309.98. When East African debt is disaggregated, each Ugandan owes a low of $18.02 while Kenyans are the most indebted with each Kenyan owing $416.36. That Kenya's domestic per capita debt is almost double that of Ethiopia can be ascribed to Kenya's smaller population. In real terms, however, domestic debt weighs heaviest on Burundi's nationals. Every Burundian must give up 47 per cent of his income in order to pay for the domestic portion of debt. Ugandans, on the other hand, are the least domestically leveraged in the region giving up a low 3 per cent of their GDP to domestic debt. At 30 per cent and 28 per cent, Kenyans and Ethiopians are almost equally indebted to their domestic lenders. In relative terms, Ethiopia, Uganda and Burundi are the least productive economies. While these countries drag down the per capita income of East Africa as a whole, the remaining countries are led by Kenya in raising the region's productivity. Kenya accounts for 18 per cent of East Africa's population and 30 per cent of its GDP. Where Kenya and Ethiopia diverge in their contributions to the region's productivity, they are united once more in the size of their respective domestic debts. Should those debts come due in the short term, these two countries may see inflationary monetary policies and higher taxes as their governments seek to repay their debts. Domestic lenders to governments are repaid through tax revenues. Potential tax revenues are dictated by the size of a nation's industrial base, which in turn dictates the size of the tax base. Agrarian activities are not themselves easily taxable. In order to raise funds to pay off debts, a country needs an industrialised economy. Kenya's 22.30 per cent tax revenue to GDP suggests that its tax base was the largest and that its economic base the most robust of the region. Ethiopia, the largest economy in the region, itself raised 14.4 per cent in tax revenues against its GDP. This seems to suggest that Ethiopia has a less significant industrial footprint relative to Kenya and relatively subpar economic productivity. On that metric, Uganda was the least successful in the region with Tanzania just a few points ahead. Together with Burundi, the performance of tax revenue against GDP for the three East African countries ranged between 14 per cent and 15.5 per cent. Kenya's industrial base and economic productivity places it ahead of its East African peers in its ability to generate tax revenue. When revenues generated are placed against these countries' debts, Kenya is shown to be among the least successful owing to the large size of its debt. Kenya's domestic debt was 1.3 times the size of its revenue. Against tax revenues, Burundi's debt remains the most crippling. Burundi's debt is three times the size of its revenue. An agrarian economy mired in civil unrest makes for a difficult revenue raising environment. That the government would inflict such a burden on a weak domestic economy suggests a crisis that the national leadership seeks to head off through expansionary fiscal policy. It may also suggest a desperation to cement legitimacy. This all depending of course on when precisely Burundi's debt was incurred. Tanzania's domestic debt is just about 50 per cent its revenues. Uganda's domestic debt is 20 per cent its revenues. Though Uganda has a small tax base, the data suggests that it does not borrow excessively from its domestic markets. President Muhammadu Buhari of Nigeria was quoted in his country's latest budget speech as saying that Nigeria funds less than 6 per cent of its budget with non-oil revenues. Though Nigeria's industrial base is larger than that of East Africa, the government's revenues are healthy without industry-based revenues. East Africa may not be able to count on such circumstances. In addition to their grand infrastructure projects, East African countries need to further industrialise in order to generate the revenues necessary to pay off debts. Countries face the choice of borrowing either domestically or internationally. International debt is owed to bilateral and multilateral lenders that include advanced economies and multilateral financial institutions like the World Bank and the IMF and international financial institutions such as multinational banks. Foreign debt is issued in foreign currency. East African countries earn foreign currency from exports and will hold those currencies to pay off debts and pay for imports. Should they continue to borrow internationally, Uganda, Tanzania and Rwanda could see their exchange rate risk go up. Tanzania recently received a sovereign credit rating that will give it access to international capital markets. It seeks to raise at least $1 billion from international capital markets in the next two years. A country like Tanzania - with all signs of its foreign denominated debt increasing -- could be a regional gateway for an exchange-rate crisis. Inability to pay off international debt will make imports expensive. As the landlocked countries of Uganda, Rwanda and Burundi rely on Kenyan and Tanzanian ports, the costs of commodities in the region could rise sharply in the face of an exchange-rate crisis. Ethiopia's capital controls have seen the country's foreign reserves shrink to $3.2 billion or less than what it spends on two months of imports. In order to generate the foreign currency reserves needed to pay off its international debts, it will have to jump-start economic activity and ramp up exports to earn itself foreign currency. Though Chinese loans have seen a slowdown, aid from friendly nations like the $1 billion recently received from the United Arabs Emirates could bridge the gap as the country works towards enlarging its industrial base. Domestic debt, on the other hand, carries with it the risk of inflation and crowding out of the loanable funds market. Kenya and Ethiopia may need to be more disciplined when it comes to domestic borrowing in order to ease up credit for their respective private sectors. The private sectors could then move to invest in productive enterprise that will generate the taxable revenues that can then be used to pay off domestic debt. Should those productive enterprises also generate exports, then the countries could see their foreign-currency revenues rise high enough to also pay off their foreign denominated debt. In short, in order to pay for domestic debt, East African countries need to institute measures to generate economic growth. Struggling Zimbabwe Coal Miner Plans to Sell Town to Settle Debt?